University of West Florida survey reveals that textbook affordability continues to be a key determining factor in student preparedness and academic success. 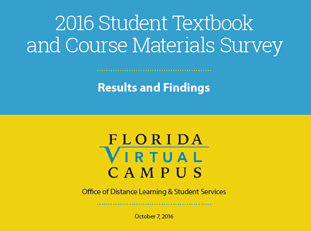 The results of a recently released survey, 2016 Student Textbook and Course Materials Survey Report conducted by the Office of Distance Learning and tudent Services of the University of West Florida’s Virtual Campus, shows that the high costs of college course materials continues to undermine student access, student preparedness & academic success. Out of the 22,000+ Florida students surveyed, over half of them (66.6%) said they did not purchase the required textbooks for their courses because they were too costly. A lack of access to affordable course materials led to a decrease in student preparedness for courses with 57.4 percent of UWF students saying they either failed a course or earned a poor grade because they couldn’t afford to purchase the required textbooks (37.6% earned a poor grade; 19.8% failed a course). Similarly, a nationwide 2016 survey conducted on behalf of Akademos (see our College Student Survey Results Exclusive White Paper) found that 39% of the students surveyed have taken a course without the required materials because they’re too expensive and 40% of them indicated that they only purchase “some or none” of their required course materials. In addition, 60% of these students said they think they would have performed better in their courses if they’d only had the required materials. The UWF survey also suggested that time to graduation is being negatively impacted by a lack of access to affordable textbooks with 47.6% of students reporting that they “occasionally or frequently” take fewer courses because of it; 45.5% do not register for a course at all; 26.1% drop a course and 20.7% withdraw from courses. The Akademos nationwide survey found that 12% of students opted not to register for a class or dropped a class due to high course materials costs. Fewer classes equal a longer road to graduation and a decrease in college and university completion rates. Another interesting conclusion drawn from the UWF survey is that financial aid coverage for textbook costs has actually gone down since their 2012 survey; 70.7% of students reported that they received financial aid in Spring 2016 in contrast to 75% of students in 2012. The survey also revealed that out of the 70.7 percent of students receiving financial aid, approximately one-third of them (29.2%) reported that their financial aid covered “none” of their textbooks costs. According to the 2016 Akademos student survey, over half of students report being “dissatisfied” or “extremely dissatisfied” with the cost of textbooks at their institution. With the high prices of course materials at the forefront of student minds, it’s important for institutions to offer their students greater access to lower cost options at their school-sanctioned bookstore. For a resource on solutions for college bookstores that addresses textbook affordability, accessibility and student success, click here to request our exclusive Future-Proof Your College Bookstore eBook.